Lupus is a chronic autoimmune disease in which the immune system, meant to fight infection, instead attacks the body’s own tissues to cause inflammation and damage. The study found that specific changes in just two of the 3 billion coding units making up a person’s genetic code were present in people more likely to develop severe lupus nephritis. Occurring in about half of lupus patients, nephritis is the kidney damage resulting from the immune attack. “Historically, the medical community has attributed the greater frequency of end-stage renal disease in African-Americans with lupus solely to social factors, like higher poverty and lack of access to care,” says Robert Kimberly, M.D., director of the Comprehensive Arthritis, Musculoskeletal and Autoimmunity Center at the University of Alabama at Birmingham and study leader. Infectious disease scientists had established over time that some people in Africa are able to resist infection by parasites called trypanosomes, which are spread by the bite of the tsetse fly and cause a disease called sleeping sickness. "Our study results argue for that, on top of very real social factors, genetic differences contribute to a person’s risk of kidney failure." Further studies had revealed that small changes in a gene called APOL1 were one source of this protection from parasites. For reasons unknown, the altered gene codes for a version of a protein capable of killing the parasite. Unfortunately, the same changes in APOL1 that protected against trypanosomes also made a person more at risk for a rare form of kidney disease called focal segmental glomerulo sclerosis, again, for reasons unknown. Humans genes constantly, randomly and slightly change their code as they pass on genetic instructions. Some changes, called mutations, make no difference, others improve survival chances in changing environments and others cause disease. Making matters more complex, some changes, like those seen in APOL1, help people live long enough to have children but then cause disease as they age. Altered versions of the gene APOL1, or apolipoprotein L1, have also been strongly associated in past studies of African-Americans with more severe kidney disease in HIV-associated collapsing glomerulopathy and hypertension-attributed end-stage renal disease. Other labs are exploring whether or not APOL1 variants drive kidney disease severity in diabetes, and the study presented today at ACR provides the first association between the altered gene and severity in lupus nephritis. Apolipoproteins like APOL1 are famous for being one part of “good cholesterol,” which ferries bad cholesterol to the liver before it can build up in arteries to cause cardiovascular disease. The body, however, puts the same proteins to work in many places, and APOL1 appears to also have a role in the immune system, and in related inflammation. As the good cholesterol containing APOL1 circulates in parts of the body affected by disease, it can be altered (e.g. oxidized) as part of inflammatory diseases, says Kimberly, possibly becoming a version of itself that further damages cells. In addition, studies show that one part of the APOL1 protein is shaped like Bcl-2, a protein known to regulate the process where cells decide to self-destruct when it’s in the body’s best interest. A virus, for instance, may have invaded a cell and turned it into a virus factory. Could an altered version of the APOL1 protein be good at convincing both parasites and kidney cells to self-destruct? Kimberly and his colleagues tested for associations between these two altered versions of APOL1 and end-stage liver disease related to lupus nephritis in a national sample of unrelated African-Americans with systemic lupus erythematosus, the formal name for lupus. The study sample included 668 cases in African-Americans with end-stage renal disease related to lupus nephritis and 697 African-American patients with lupus but no kidney damage in the 10 years since they were first diagnosed. With the patient samples in hand, the team performed a genome-wide association study or GWAS, a type of analysis made possible in recent years by the availability of computing power and high-speed genotyping technologies, which can compare the genetic make-up of a patients with and without a disease. A GWAS determines the variations present at each spot in the gene code for each person and the degree to which any variation is associated with a given disease. In the current GWAS study, two APOL1 gene variants were shown to be strongly associated with end-stage kidney disease in African-American patients with lupus nephritis. The study also found that, of patients with lupus who did go on to develop nephritis, it took an average of four years for those with the APOL1 mutations to progress to end-stage disease, while the average for those without the mutations was six years. All the results were statistically significant. 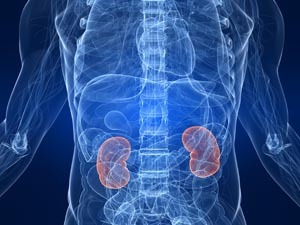 The two changes in APOL1 linked to risk of kidney disease severity were called G1 and G2. G1 is a missense allele, where a change of a single nucleotide building block of the genetic code’s DNA chain causes a different amino acid to be built into the protein it codes for. G2 is a cutting out or deletion of adjacent asparagine and tyrosine residues at another spot in the code. The study was funded in part by the American Recovery and Reinvestment Act, which enabled the research team to find and analyze the genetic information of 1,400 people from across the country with lupus and kidney disease. Also pivotal was the expertise and effort of researchers from the more than 20 institutions that partnered with UAB for the study, as well as the logistical contributions made by UAB’s Center for Clinical and Translation Research, of which Kimberly is director.